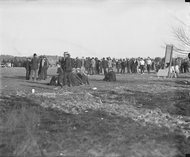 Crowd and players during the Australian Rules Football final. 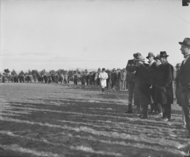 Crowds at the Australian Rules Football final. 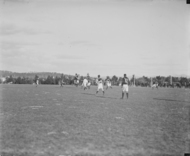 One of teams involved in the Canberra Australian Rules Football final. Some of the crowd at the Australian Rules Football final. Two boxers with trophy belt and spectators. Game of bowls in progress at Hotel Canberra with HR Waterman looking on and West Block in the background. Part of the crowd at a school sports day at Acton Sports Ground. Children on a see-saw and swing at a school sports day, Acton Sports Ground. 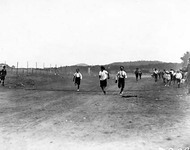 The start of a girls race at a school sports day, Acton Sports Ground. Crowds at a school sports day, Acton Sports Ground. The obstacle race at a school sports day, Acton Sports Ground. The finish of a boys race at a school sports day, Acton Sports Ground. Jockeys and racehorses in the saddling ring, Acton Race Course. Part of the crowd at a race meeting, Acton Race Course. Part of the crowd of race goers at a race meeting, Acton race course. Part of a crowd of race goers at the race meeting, Acton Race Course. Bowls on the bowling green at the Hotel Canberra. 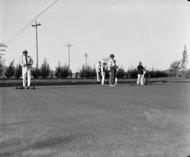 Bowlers on the bowling green at the Hotel Canberra. Opening of the bowling green at the Hotel Canberra by Lady Butters. Cricket match in progress, Acton sports ground. Jockeys and racehorses in the saddling ring, Acton Racecourse. 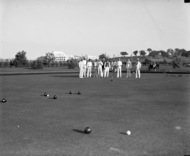 A game of bowls in progress at the Hotel Canberra bowling green. Two boxers in ring (published in CC news, April 1927). Game of bowls in progress at the Hotel Canberra green. Ainslie Football Club officials. Back row: F Hoysted, A Sutton, M Kilpatrick, R Carlson, J Patterson. Front row: T Gillard (Treasurer), R Gow (Secretary), I Rippon, P McNamara (President), J Davies, K Carnall. 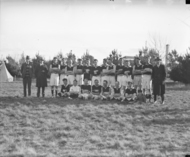 Ainslie Australian Rules Football team. 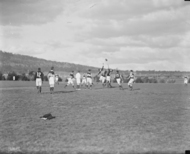 ACT Football team to play against Queensland. 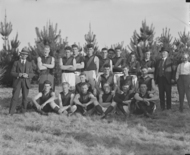 The Acton Australian Rules Football team, premiers in 1927. Visit by the Ashfield Bowling Club of Sydney. 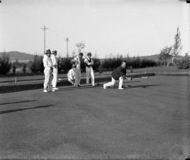 A game of bowls on Hotel Canberra greens. Visit by the Ashfield Bowling Club of Sydney, on the Parliament House greens. Visit by the Ashfield Bowling Club of Sydney on the Parliament House greens. Visit by the Ashfield Bowling Club of Sydney, on the Hotel Canberra greens.